Special discount up to 20%* when booking a minimum stay of 7 nights up to 14 nights in Formula Residence. With Formula Residence, parking and Wi-Fi are included in the price; breakfast not included. 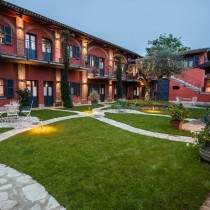 Choose your holiday or business apartment in Moncalieri now and enjoy the benefits of a totally independent stay with all amenities included, just a few minutes from Turin! * 7 nights: 15% discount; from 8th to 14th night – 20% discount. Reservations can be cancelled without any charges up to 3 days before arrival.